Cheese is a great dairy product that is not only full of calcium, it tastes great too. Many recipes include cheese either as a main ingredient or as a topping to add the finishing look and flavor. In this section of tips, you'll find information about gourmet cheeses and how to use them. While cheese comes in a convenient block, sometimes you need to grate it. You'll find a tip here on how to make that job easier. The following articles are available for the 'Cheese' topic. Click the article''s title (shown in bold) to see the associated article. Have you ever noticed how well the taste of cheese and fruit go together? It almost seems like they were specifically made to compliment one another. Well, why not use that unique strength to make a truly fantastic dessert? Here is a great recipe for some cranberry-brie tarts that plays to all the strengths, and leaves you wanting more. 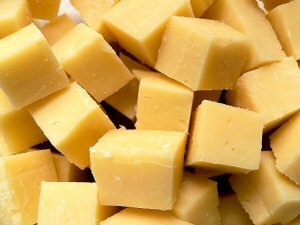 When it comes to English cheese, you are probably most familiar with Cheddar, one of the world's most popular cheeses. But if you are looking to try some new deliciously unique cheeses, check out other English cheese varieties too. Unlike many other kinds of gourmet food, gourmet cheese is actually pretty affordable. What's more is that you can find gourmet cheese in a surprising number of places today. Here are a few guidelines that you can use to help you find, and recognize, gourmet cheese. Want to clean up your cheese grater easier? What if you can't find your grater at all? Find the answers to all your grating questions here. Typically when people think about Irish cheese, if they think of it at all, they think of a mild form of cheddar. However, there is quite a bit more to it than that. Here is a brief description of the various kinds of Irish cheeses available, where they are made, and what they taste like. Use this reference list to help you create some truly fantastic dining experiences. When done right, a grilled cheese sandwich can arguably be one of the best comfort foods around. The trick though lies in making the perfect grilled cheese sandwich. Just follow this recipe to ensure that you get that perfect sandwich. Cheese, no matter the type, can be a great ingredient when cooking. One of the most useful ways that you can utilize cheese is in a sauce of some sort. However, melting cheese for sauces takes a little more effort than simply tossing it into the microwave. Follow these directions to ensure that you get it done the right way.